New England Patriots quarterback Tom Brady is in the midst of one of his greatest seasons. His fans should be sure to pay close attention to this year’s playoffs because it could well be his last hurrah. Patriots coach Bill Belichick may want to strongly consider doing whatever he can to ensure that backup Jimmy Garoppolo remains in the New England fold, even if the cost is prohibitive and he has to turn down the draft choice lucre that other teams are likely to offer in trades that could help him solidify other positions for years to come. But why? Brady is at the top of his game and has talked about playing until he is 45, which means five or six more seasons. He is the ultimate competitor and he continues to carry a determined chip on his shoulder from being overlooked in college and during the football draft as well as for having aspersions cast upon him and his accomplishments by those who believe his success is mostly attributable to The Tuck, Deflategate and having played for the greatest coach of all-time. Brady remains driven to do more, to prove more. Voluntary retirement does not appear to be in his immediate plans. Yet fans, whether of Brady or of just good football in general, and the Patriots’ organization should be very aware that it is most likely to be all downhill for Brady from hereon. If you want to see, savor and remember an athlete in top form, now may be the best time to take a last look at one of the greatest quarterbacks to ever have played the game. Unlike for the young Mick Jagger, time is not on his side, no it is not. The fall for quarterbacks who play so well for so long is often notoriously steep. Two simple examples will suffice. In 2013 there was a young quarterback, at least in comparison to Brady’s current 39 years, named Peyton Manning who tossed a record setting 55 touchdown passes and compiled a 115.1 passing rating for the Denver Broncos at age 37. The following year Manning threw 39 touchdowns and had a 101.5 rating at age 38. He followed that up with just 9 touchdowns and a 67.9 rating in the 2015 season which ended in a glorious Super Bowl victory to which any of his athletic contributions were a distant afterthought as a Wade Phillips / Von Miller led defense stifled both the league and, in the most important game of the year, Most Valuable Player Cam Newton. In 2016, Manning was out of football just three seasons removed from one of the greatest passing seasons of all-time. By rights, if athletic production was all that counted, Manning probably was through earlier in 2015, nearly having lost his job to Brock Osweiler. Sure he had been injured, but he remained on the bench for several weeks after he told John Elway that he was ready to return to action. Elway thought otherwise and Manning would have been “Bledsoled” if Osweiler had been a better quarterback. Instead, Osweiler was unable take advantage of his opportunity, Manning returned as a “game manager” and us fans were provided the pleasure of hearing a once great quarterback shill for a pizza parlor at the conclusion of one of the greatest defensive efforts in Super Bowl history. The lesson to be learned from Peyton Manning is that the fall can be decisive. But even in that fall, although I can’t forgive one of the most highly compensated athletes of all time for his selfless shilling, Manning did indeed remain a great game manager. It was, however, pathetic to watch how much shorter his passes decreasingly became. The numbers do not do the decline justice: 8.3 per attempt in 2013, 7.9 in 2014, 6.8 in 2015. My second example of what may be in store for Tom Brady as he approaches his 40th year comes from a bit further back. Those of us who were lucky enough to be around at the time interest in professional football began to explode might recall Y.A. Tittle. Tittle was in the midst of his fifth professional football when I was born. He was generally considered a good, perhaps underrated, quarterback on mediocre San Francisco teams. Following the retirement of Hall of Famer Otto Graham after the 1955 season, the New York Giants quickly became the toast of the NFL and dominated the Eastern Division finishing first in 1956, second in 1957 and first again in 1958 and 1959 under the leadership of quarterback Charlie Conerly and coach Jim Lee Howell. Then, in 1960, the unthinkable happened for the Giants and the city of New York. The team finished third with a record of 6–4–2. Howell was out as coach, retired. Conerly had led the team to a 5–1–1 record during the season but was already 39. George Shaw, who was a mere babe of 27, just wasn’t good enough to be accepted after going 1–3–1. The Giants traded for Tittle in a lopsided trade that presaged the Lou Brock / Milt Pappas swap that was to occur in another sport just a few years later. I was 9. Tittle had already played 13 years as a pro. During the upcoming 1961 season he would be 35. Tittle began a dominant run of regular season success that has rarely been matched by any but superstars. During the next three seasons he led the Giants to a 31–5–1 (.851) record. His backups, Charlie Conerly and Ralph Guglielmi, went 2–2 and 0–1, respectively, in his absence. Tittle raised the Giants passing game to another level and led the Giants to Eastern Conference titles in each of his first three seasons. In 1961 he was just getting started. In 1962, at age 36, he led the league with a record setting 33 touchdown passes breaking a mark previously set by Johnny Unitas. This was in the era when running the ball was the dominant strategy. If it hadn’t been for 1963 season that record would have gone unmatched for the next 19 years until the San Diego Chargers Dan Fouts of air Coryell fame also tossed 33 touchdowns in 1981. But Y.A. Title outdid himself in 1963 at age 37 by throwing 36 touchdowns, a record that lasted until Miami Dolphins Dan Marino’s great 1984 season, 21 years later. Y.A. Tittle was at the top of his game. He had just finished seasons where he was 8–1–1, 12–2, 11–2. He had just set the record for touchdown passes, and then broken it again at ages 36 and 37. He was two years younger than Tom Brady is now. By the time he reached Tom Brady’s age he was out of football. Favored to win a fourth consecutive Eastern Conference title in 1964, the Giants finished 2–10–2. The team was 1–8–2 with Tittle behind center. Tittle retired, broken as a player. 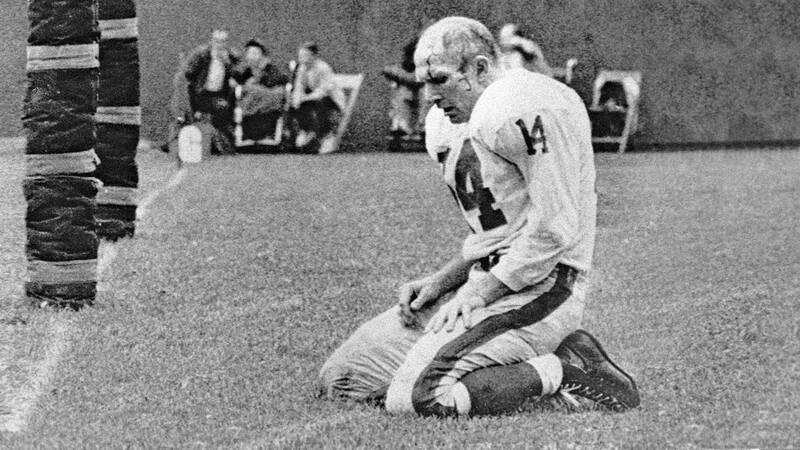 After having established touchdown passing records that would stand for two decades two seasons in a row, Tittle had barely been able to play one more year, a shell of his prior self, a victim of some devastating hits. This iconic photo shows what Tittle looked like near the end. Bill Belichick has probably already given this some deep thought. He knows what it is like to replace a quarterback who was a star. After all, he “Bledsoled” Drew Bledsole when Brady proved he could handle the position. Belichick also jettisoned the diminished skills of Bernie Kosar at age 29 for Vinnie Testevarde when Cleveland fans still revered Kosar as an icon for getting them so close to the Super Bowl before falling to the Broncos in two AFC Championship games. Belichick knows the value of retaining a viable backup who can be trusted to guide a team through an entire season if necessary as Matt Cassel needed to in 2008 when Brady was injured or through parts of a season as happened earlier this year with Jimmy Garoppolo and Jacoby Brisset. When the time comes, Belichick is likely to be ready to make a quick, decisive change. He will not dawdle. I am not saying Tom Brady is finished. After all, he is currently playing strong and no one knows how the future will work out. It’s just that it is most likely that Tom Brady’s career will not last much longer despite his, our, or even Bill Belichick’s desire that he continue to play at this level forever, or at least until he turns 45. Anything can happen. Brady might decide that training camp or taking constant hits is no longer worth it. A knee or ankle can bend the wrong way. A rotator cuff can be torn. A suspension can be meted down for presumably letting go some “hot” air. A devastating hit due to a missed block or a billionth of a second delay in sensing the rush can lead to a concussion that slows things down and makes further injury ever more inevitable. Sometimes old age just creeps in and takes over. Join me in appreciating Tom Brady while we can. He has not been, and will never be, my favorite player or quarterback. In fact, he has outplayed my personal favorites on so many occasions that I hold some sense of bitterness. But I, and I dare say you as well, are unlikely to witness another quarterback like Tom Brady for a long, long time.